Is there anything better than Grilled Flank Steak?! Well, yes there is, it is Chimichurri Flank Steak. Then take it one step further with sweet new potatoes and you have Grilled Steak with New Potatoes and Chimichurri Sauce! Add Chimichurri Sauce to Take Steak to a Whole New Level! I’m pretty simple when it comes to what I like. Daisies. The color pink. Cats. Books. Meat and potatoes. Yes, whoever decided that meat and potatoes were a guy thing … never met me. I love meat and potatoes. I think if I was ever condemned and had one last meal, it would include a perfectly grilled steak, downy soft new potatoes, and of course, watermelon. Now, there is nothing wrong with a perfectly grilled steak and new potatoes with just some salt and pepper and a little butter. That’s heaven. But if you want to take it to a whole new level, add some chimichurri sauce. Man oh man, that’s good. So, let’s step our of our boring meat and potatoes rut and embrace the Grilled Steak with New Potatoes and Chimichurri Sauce. I found this recipe in Grill Everyday, a wonderful little cookbook with simple grilling recipes that make weeknight grilling oh-so-easy! The original recipe called for flank steak, which I love. This recipe is so simple. You basically boil the potatoes until tender, and while they are cooking you make your chimichurri sauce. If you’ve never had a chimichurri sauce, it is a garlicky herb sauce from Argentina, you’re going to love it. Then you grill your steak to your liking and plate it all topped with the sauce! Easy peasy. You might want to make Grilled Parmesan Tomatoes to go with it! To serve this for Father’s Day – some Boozy Bourbon Pops would be the perfect dessert! Some of my favorite grilling tools: Instant Read Thermometer, Long Handled Basting Brush, and Grill Basket. 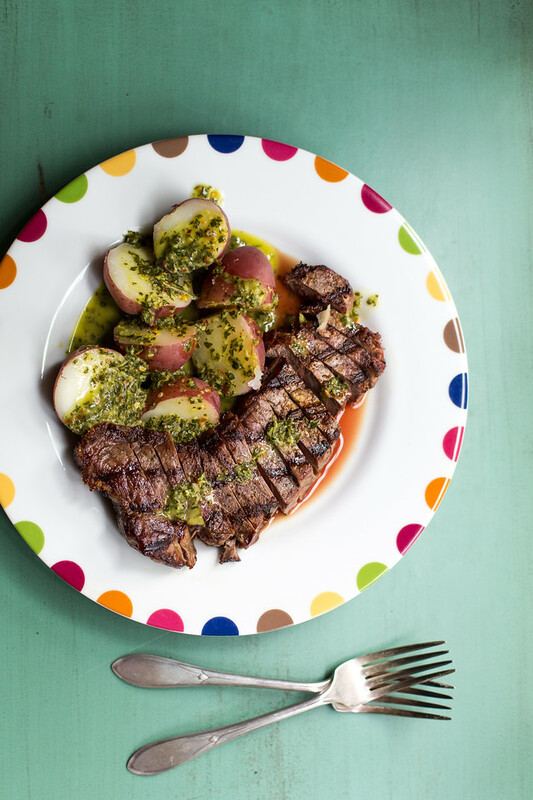 This Grilled Steak with Potatoes and Chimichurri Sauce is perfect for Father's Day! Remove the flank steak from the fridge about 30 minutes before you plan on grilling and place it on a large rimmed baking sheet. In small bowl, combine two tablespoons olive oil and the garlic and rub into both sides of the steak and season both sides with salt and pepper. Wash the potatoes, but leave the skin on. Place the potatoes in a saucepan and cover with water by 1 inch and add the salt. Bring to a boil and turn the heat down until the water just simmers, cover partially and cook for about 20 minutes or until potatoes are tender when pierced with a fork. Drain, let cool slightly and halve. While the potatoes are cooking make the chimichurri. Place the garlic, red pepper flakes, cumin, 1/2 teaspoon salt, and sugar in a food processor. Process until the garlic is minced. Add the parsley and lemon juice and pulse into the parsley is finely chopped. While the machine is running, pour the 1/2 cup of oil through the feed tube and process until well blended. Set aside. Grill the steak. Preheat your grill to high. Oil the grate and place the flank steak directly over the flames. Sear the steak on one side for about 4 minutes, turn and sear the other side for about 4 minutes or until your desired degree of doneness. Transfer steak to a cutting board and let rest for 10 minutes and then slice across the grain. 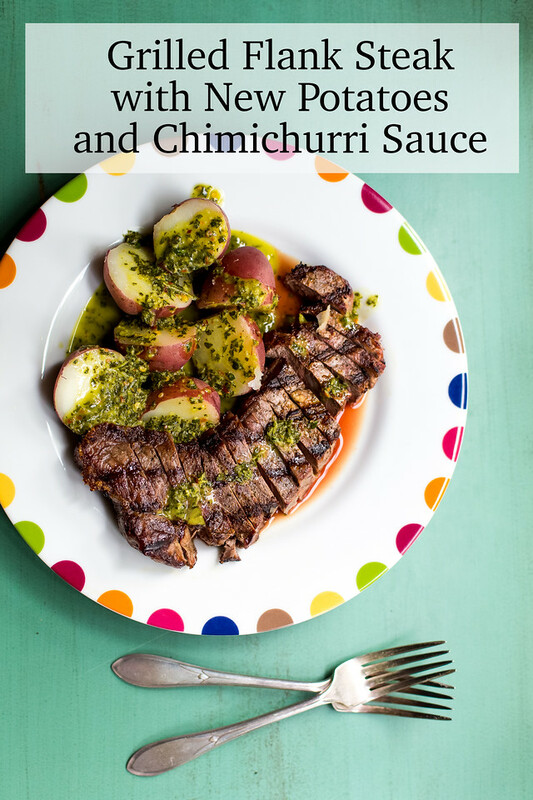 Chimichurri is probably THE best condiment for steaks ever. Those Argentinians know a lot about beef and it shows in this condiment. This is a great sauce and a lovely plate of food! Your post is awesome and thanks so much for sharing it with us at Full Plate Thursday. Hope you are having a great day and come back to see us real soon! Looks tasty. Steak and potatoes are a winner any day. Great chimichurri recipe. Looks excellent. Grilled Filet Mignon would be my choice with those read potatoes. Delicious. Your Grilled Steak with Potatoes will be featured on Full Plate Thursday this week. Enjoy your new Red Plate and have a great day! This looks gorgeous, Pam! The simple things are definitely best when they look like this! Stumbled this post. Thank you so much for sharing your delicious Grilled Steak and Potatoes with Chimichurri Sauce with us at the Hearth and Soul Hop. Simple is often the best. I’d probably swap out the chimichurri for salsa verde. I know, salsa verde is a huge favorite of mine! I have had chimichuri sauce at Longhorn’s restaurant and I loved it. I am going to have to try this.